The mission of the Mansfield Township Police Department is to work in cooperation and partnership with the community to ensure the safety and security of all citizens. We are committed to serving all residents of Mansfield Township, and to assisting them to achieve the highest quality of life to which they aspire. We will achieve these goals while protecting, preserving, and safeguarding the constitutional and civil rights of all citizens through impartial and courteous law enforcement, with integrity and professionalism. 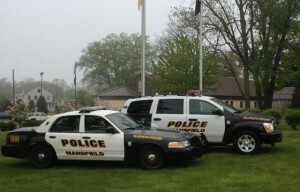 The Mansfield Township Police Department’s origin dates back to 1944. The first Officer and Chief was George Shaedle. One of Chief Shaedle’s duties was to regulate traffic on old Route 39 (now Route 206) when the highway passed through the Village of Columbus. Chief Shaedle and other early members of the department would also settle any disputes occurring between Township residents. The officers that served the Township during this time worked part-time and used their personal vehicles for patrol, as well as citizen band radios for communications. Because there was no established police headquarters, officers responded as needed and when available from their homes. These members did not wear a formal patrol uniform or carry a department-issued firearm. Instead, they were dressed in street clothing and carried their personal firearms while on duty. It wasn’t until the late 1960s that members began wearing an informal patrol uniform, which consisted merely of a blue shirt and an old badge that was shared among the members. However, they still carried their personal firearms. The Police Department began to develop in the 1970s. The Department moved into an established building, which was located behind their current building. The Township Committee created a budget for the Department, which enabled them to purchase equipment. During this time, the Department’s first firearms were purchased. The Model 10 Smith and Wesson handgun was purchased and issued to its members. Also during this time, the Township began to purchase a formal patrol uniform for the members to wear. In 1972, the Department purchased their first patrol vehicle, a 1972 Buick Wildcat. The vehicle was white in color, with Mansfield lettering on it and a red “gumball” light on the roof. On 01/01/1978, the Department’s first full time Chief, James Humble, was sworn in. When Chief Humble took office he became the Department’s first full time officer. Chief Humble served from 1978-2006 and was the Department’s only full time Chief. The Department under Chief Humble continued to grow during this time. They added additional patrol vehicles as well as additional staffing. The Department purchased its first speed measuring equipment, Vascar, to help regulate traffic speed within the Township. The Department was dispatched by the Florence Township Police Department during this time until the County established a Central Communications Center in the late 1980s. It was also during this time that the Department changed firearms. Officers began carrying the Smith & Wesson Model 19, then switched to the Smith & Wesson Model 469, until transitioning to a semi-automatic Sig Sauer Model P220, which remains the department issued weapon today. 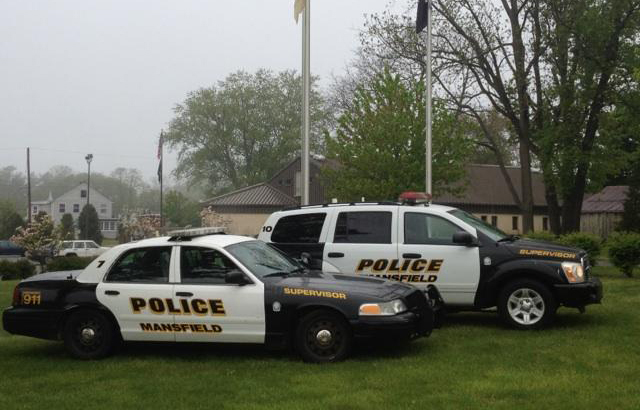 In 2001, the Department began serving the Township of Mansfield on a full time basis. In 2007, the Department continued to grow even more. With permission from the Burlington County Prosecutors Office, they assumed full responsibility to investigate all incidents. The services of the New Jersey State Police were discontinued with the establishment of the Detective Bureau. The Department today consists of a Chief of Police, a Lieutenant, four Sergeants, seven Officers, a Detective, a part-time Class II Special Law Enforcement Officer, and a two person clerical staff. The Department has several units, including but not limited to, the Records Unit, Community Policing Unit, Detective Unit, Traffic Unit, and the School Resource Officer Unit. The Department also processes firearm applications for Township residents. The Department is equipped with a Crash Reconstruction Unit, which investigates all serious and fatal crashes occurring within the Township. The Department also registers all Megan’s Law offenders residing in the Township. The mission of the Mansfield Township Police Department is to work in cooperation and partnership with the community to ensure the safety and security of all citizens. © 2019 Mansfield Police Department. Design by Networks Plus LLC.